I love finding new things to put in the microwave. Say, for instance, an incandescent light bulb, which can test your microwave for a number of issues, besides just looking awesome. Even a non-functioning bulb can work, so dig out the dusty old bulbs you have at the back of the closet. First, find a short juice glass and add some water to it. Put the bulb in the glass like it's a flower in a vase. If the water doesn't cover the metal casing of the bulb, add more water until it does. The water serves two purposes. First, it's very bad for a microwave to be working with nothing, or only very little, inside it. The water soaks up a little of the energy that's going to be bouncing around inside the microwave. The water also covers the metal casing of the light bulb, preventing sparks. As the bulb goes round, it will flicker, lighting up, and dying down. The waves inside a microwave interfere with each other, sometimes adding up together and creating areas of high intensity, and canceling each other out and creating areas of very low intensity. High intensity areas cause high intensity light. Low intensity areas cause no light. The light is generated in light bulbs by electrons racing along the filament, heating it up and making it glow. Put the light bulb in a lamp, and the outlet the lamp is plugged into will yank electrons back and forth. 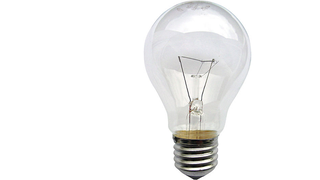 Put the bulb in a microwave, and the electromagnetic waves will also pull the electrons back and forth. Enough of this, and the filament will light up. Too much of this, though, and the entire light bulb will slowly heat up and explode, so be careful. If you've managed the rotating bulb successfully, try putting the light bulb at different spots in your microwave to see where it lights up and where it stays dark. If you ever have to take the tray out to microwave food, you'll know where to put the food to heat it up, and at what spots the food will stay cold no matter how long you keep it in the microwave. Nuke the light bulb in bursts of no more than five seconds, giving the light bulb plenty of time to cool down in between tests. If the water is heating up, make sure you change it. One final light bulb microwave test: the gas in a fluorescent bulb will also be excited by a microwave. If you suspect your microwave isn't fully sealed, and is "leaking" radiation, turn the lights off in the room, run the microwave (remember to have a large bowl of water inside the microwave so you're not running it empty) and hold the bulb close to various parts of the microwave. If the bulb lights up, then yes, your microwave needs to be fixed or replaced.